Chyna is using Smore newsletters to spread the word online. I thought peace love and baby ducks was a good book i wouldn't really change anything in the book other then the sister fighting from timeto time . But i loved how the oldest sister would write to her younger sister when she was gone away at camp . 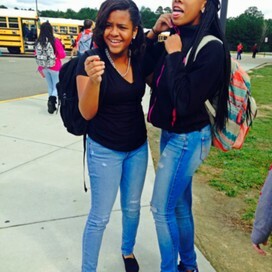 And i like how the sister siad positive thing when the oldest sister deiced to get a new hair cut. And how Anna told Carly that she would do find ob her first day of Freshman year . Some sisters might aptly be described as “alike as two peas in a pod.” That cliché certainly wouldn’t apply to 15-year-old Carly and her younger sister, Anna. Carly is self-consciously rebellious, wearing caftans and not shaving her legs after she has an eye-opening summer internship building and repairing trails in the hills of Tennessee. Carly is so confident that she doesn’t even care --- much --- when her nonconformity marks her for attention and/or ridicule at her elite Atlanta Christian school, Holy Redeemer, where designer fashions, laser-whitened teeth and perfect long hair are definitely on the agenda. Carly can also be more than a little judgmental when she witnesses behavior that she regards as superficial or shallow. Carly’s 14-year-old sister, Anna, is about to start her freshman year at Holy Redeemer. Unlike Carly, Anna doesn’t want to stick out --- she just wants to fit in. Anna’s body, however, has other plans; while Carly was off sprucing up trails, Anna was developing some terrain of her own --- on her newly-curvy body. Suddenly Anna finds herself the target of way too much attention. Boys barely hide their lust for her, girls don’t even try to mask their jealousy, and soon Anna is getting tagged with labels she hardly deserves. Just because Anna and Carly disagree on just about everything from fashion to personal grooming to popularity, that doesn’t mean they’re not fiercely loyal to each other. Anna idolizes Carly’s strong opinions and fearless attitude --- especially when Carly sticks up for Anna against their hypercritical parents. Carly is protective of her “little ducky-wucky,” as she calls Anna, even delaying her own participation in physical education so that she can take the class with her sister. Their advice to each other, “Paddle harder!” takes on new meanings in the context of new challenges and in the wake of a decision that will test their fierce loyalty like never before. Carly and Anna are so different that it’s practically inevitable that readers will recognize themselves in one or the other sister. Some might sympathize more with outwardly brash, inwardly questioning Carly, whose growing social consciousness and religious questioning are at odds with her school’s focus on conformity and unquestioned privilege. Others might relate more easily to Anna, who just wants to avoid rocking the boat even when her newly voluptuous body is making waves in spite of herself. Regardless, however, any reader who has a sister will recognize the unique, powerful bond of sisterhood that these two very different sisters share. Whether they’re taking on injustice, their parents, the world in general, or just the really mean gym teacher, Carly and Anna have a realistically strong and inspirational bond that’s sure to endure even the most dire challenges. 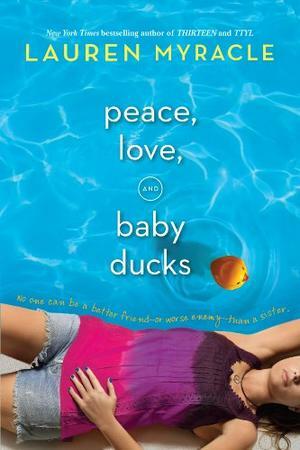 PEACE, LOVE, AND BABY DUCKS is the kind of novel that real-life sisters will read together, laugh and cry over, and use to inspire their own amazing relationships. Predictable territory is made richer by a large cast of multidimensional characters in this work of contemporary realism set in an affluent Atlanta community. "Peace, Love, and Baby Ducks." Goodreads. N.p., n.d. Web. 02 Dec. 2015. <http://www.goodreads.com/book/show/5711749-peace-love-and-baby-ducks>. "Robot Check." Robot Check. N.p., n.d. Web. 02 Dec. 2015. <http://www.amazon.com/Peace-Love-Ducks-Lauren-Myracle/dp/B0036DE59U>. "Peace, Love, and Baby Ducks Quotes." By Lauren Myracle. N.p., n.d. Web. 02 Dec. 2015. <http://www.goodreads.com/work/quotes/5883360-peace-love-and-baby-ducks>.